Sir Richard Attenborough, multiple award-winning filmmaker, actor and entrepreneur, passed away at the age of 90 on August 24. 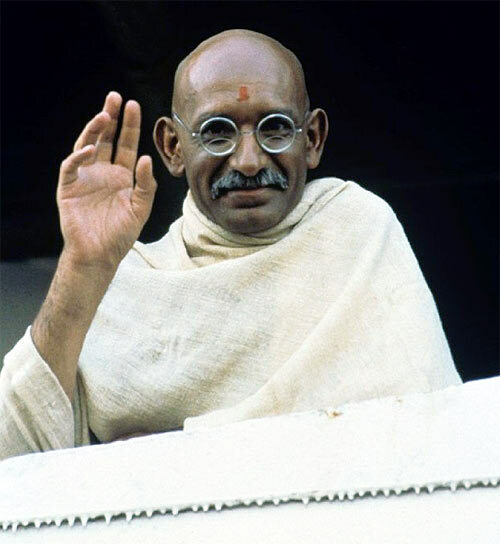 Rediff.com pays tribute to the late veteran and the crown jewel in his illustrious cinematic journey -- Gandhi. 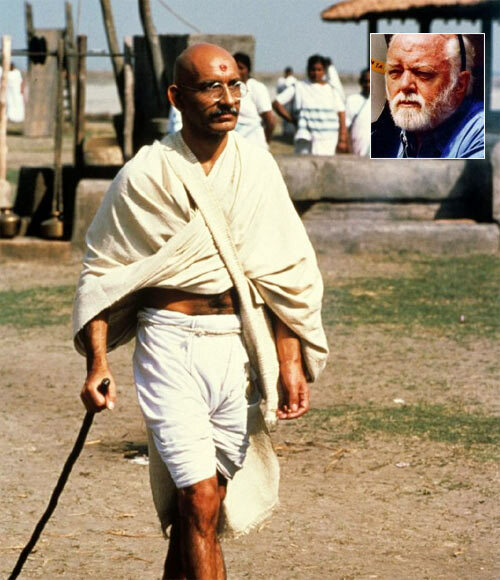 It took actor and filmmaker Sir Richard Attenborough almost two decades to get his dream project -- capturing 50 years of the Mahatma -- Mohandas Karamchand Gandhi, based on a biography by Louis Fischer, on track. At some point, the film was to be made by director David Lean with Alec Guiness as the lead but they got busy with another classic (Lawrence of Arabia). 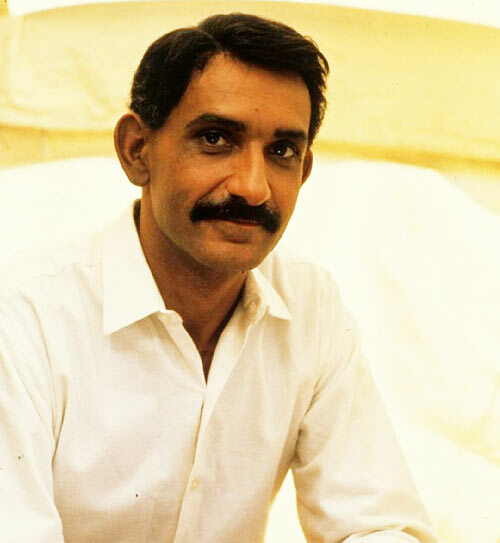 Eventually, made on a budget of $22 million with the joint collaboration of investors in the United Kingdom, the United States of America and India's National Film Development Corporation, NFDC, Gandhi went on to make history. 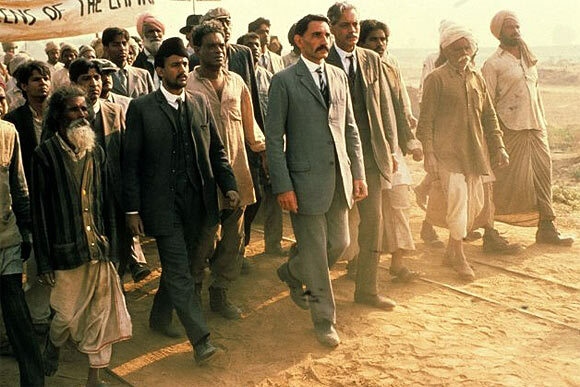 Released on November 30, 1982, Gandhi completes 30 glorious years as one of Hollywood's most memorable biopics. Often when one is sceptical about an unlikely casting selection it results in something special. Just like Tom Cruise playing Lestat in Interview With the Vampire and Daniel Craig's turn as 007 in Casino Royale was judged with a lot of suspicion only to be bowled over, Ben Kingsley astonished all with the best-ever portrayal of Mahatma Gandhi. Interestingly, the actor who is half Gujarati (he was born Krishna Pandit Bhanji) not only physically transformed to look the icon, but also successfully captured his pacifist, spiritual and visionary soul. 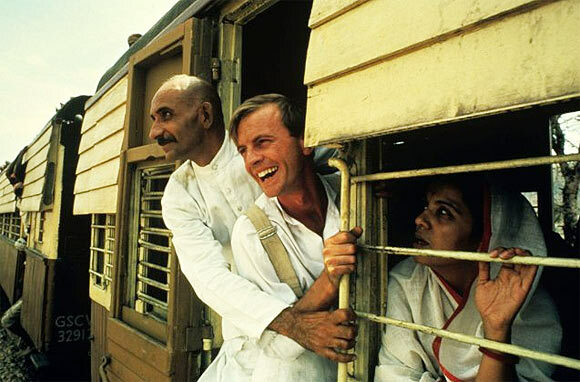 In a 1981 chat with The New York Times' Barbara Crossette, Sir Richard explains his decision to cast Kingsley, 'To attempt to play a total Caucasian as Gandhi wouldn't work. I'm equally sure that a total Indian wouldn't be acceptable to Western audiences. Rohini Hattangadi, who plays Kasturba Gandhi, read books like Hamari Ba and Ba Bapu Ki Sheetal Chhaya Mein to get into the skin of her character. In an interview to The Hindu newspaper, she recalls, 'We (her husband theatre director Jaydev Hattangadi and she) didn't have a phone. One day I got a telegram from (casting director) Dolly Thakore that Richard Attenborough is in the city and is casting for the film. Go and meet him. I was reluctant, but went. He told Dolly to ask me to lose weight and come to London for the audition. I didn't have that kind of money to spend on losing weight at a Peddar Road (in south Mumbai) clinic. Again Dolly insisted, so I did. 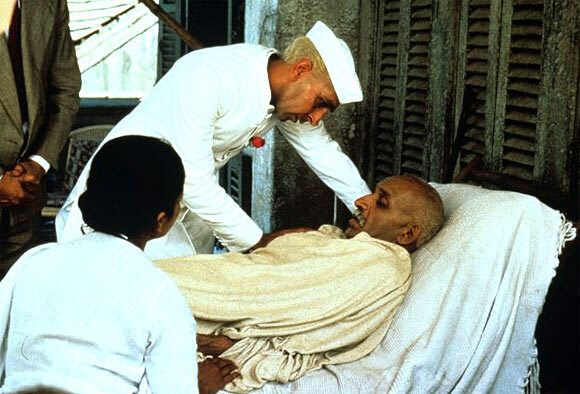 Nominated in 11 categories, Gandhi won eight Academy awards for Best Film, Director, Actor (Ben Kingsley), Original Screenplay (John Briley), Editing (John Bloom), Costume design (Bhanu Athaiya), Art Direction (Stuart Craig, Robert W Laing, Michael Seirton), Cinematography (Billy Williams and Ronnie Taylor). It also bagged a Golden Globe for Best Foreign Film. 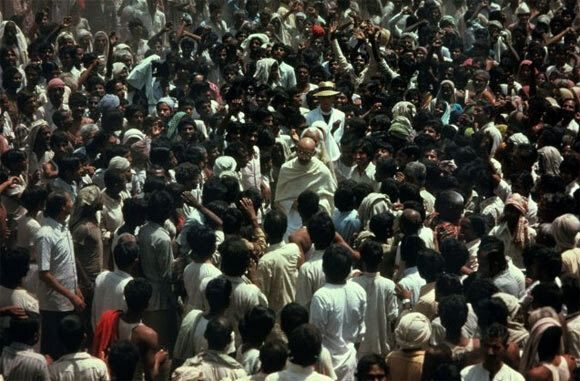 The film also made an entry into the Guinness Book of World Records for the most number of 'extras' considering over 300,000 extras appeared in Bapu's funeral scene. In 1982, Amrish Puri had nine releases ranging from the likes of Vidhaata, Shakti and Vijeta as well a brief part in Gandhi. 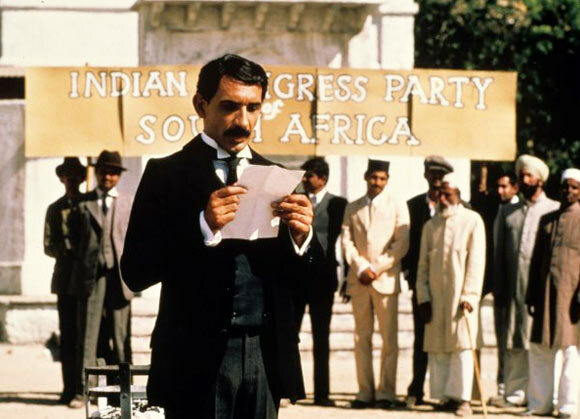 Before playing the ferocious and creepy chief antagonist Mola Ram in Steven Spielberg's Indiana Jones and the Temple of Doom, Amrish Puri worked as Gandhi's good-humoured friend Khan who assists him in launching a civil rights movement against the Transvaal government in South Africa. Professor Akbar S Ahmed, author of Jinnah, Pakistan and Islamic Identity, also the source for Jamil Dehlavi's film Jinnah, was rather critical of Attenborough's depiction of the founder of Pakistan. Among Attenborough's assistant directors were the likes of Govind Nihalani, John Matthew Mathan and Kamal Swaroop, who all went on to direct significant films later on in their careers. Dolly Thakore worked as a casting director for the film, which starred among others Rohini Hattangadi, Amrish Puri, Surpriya Pathak, Neena Gupta, Roshan Seth, Alyque Padamsee, Saeed Jaffrey, Dr Shreeram Lagoo, Pankaj Kapur, Om Puri, Alok Nath, Mohan Agashe, Dalip Tahil and Anang Desai. The soundtrack of Gandhi was created by sitar maestro Pandit Ravi Shankar and British composer George Fenton. The duo were nominated along with John Williams (E.T), Jack Nitzsche (An Officer and a Gentleman), Jerry Goldsmith (Poltergeist) and Marvin Hamlisch (Sophie's Choice) but lost out to Williams. Daniel Day-Lewis, currently winning rave reviews for his performance as the Abe Lincoln in Steven Spielberg' biopic and on track for a third Oscar, featured in a bit role in Gandhi. Day-Lewis, one of the finest actors of our times, plays a racist bully named Colin who tries to intimidate the Mahatma and his companion till he is interrupted by his feisty mother. Raveena Tandon plays Shobhaa De in next?